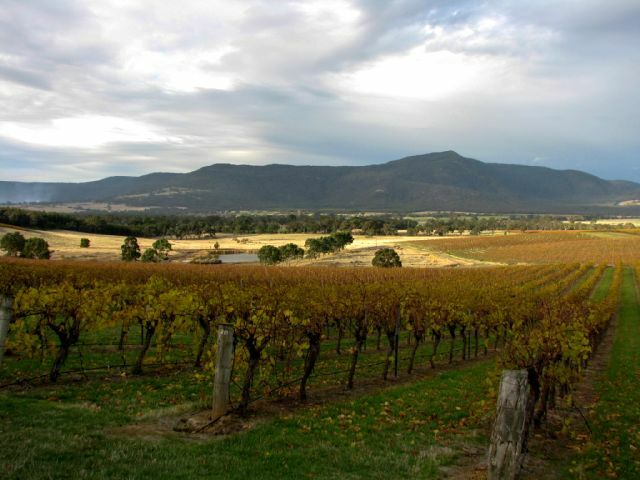 The Grampians isn’t just about the stunning mountains, native forests and picturesque pastoral scenes. The region, centred around the spectacular national park about three hours west of Melbourne, is also ideal grazing country for visitors, too, as we found out last weekend on a trip organised by Grampians Tourism. I love the Grampians in the cooler, off-peak months, when the trails aren’t as crowded and you don’t get baked when you’re out and about. Plus, there’s the fireplaces, perfect for a welcome home tipple after a day of touring, hiking or just lounging. Our first port of call – or shiraz of call, if you like – was picturesque Mt Langi Ghiran winery, a mere 15 minutes through gum tree-lined rural roads off the Western Highway at Bayindeen. 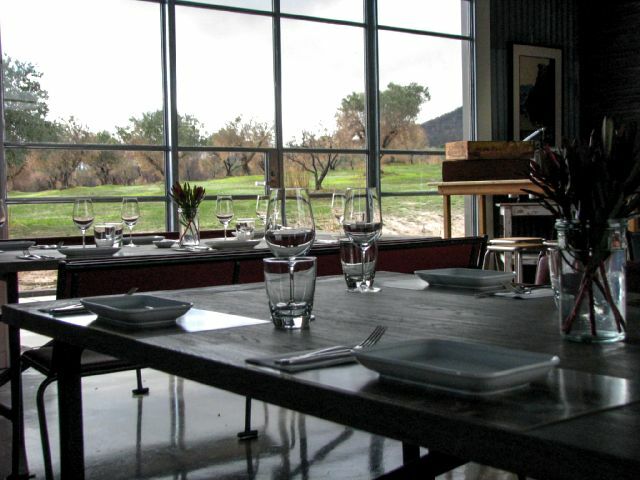 The cellar door is set on the edge of the vineyard with ranges framing the scene, and the wine is exquisite. This is shiraz country, and Langi produces an awesome line-up, with solid body and lots of pepper. There’s also cabernet, riesling, some sparklers and a refreshing pinot gris, but the shiraz really sets the tone for a great weekend getaway. 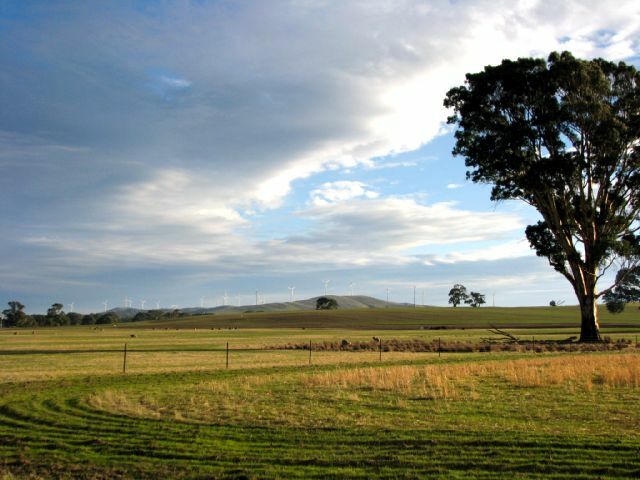 On previous visits to the region, we’ve turned off at Ararat, but this time we’re ushered further along the Western Highway to the township of Great Western, handily located between Ararat and Stawell. 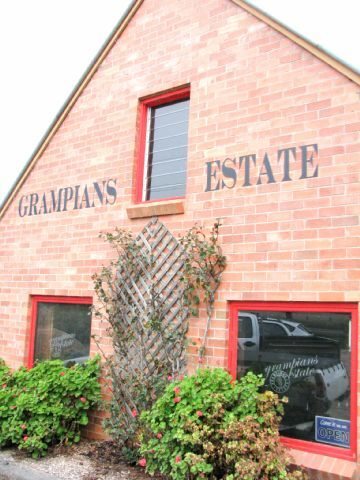 There are three cellar doors to sample – two of Australia’s oldest wineries in Seppelt and family owned and run Best’s, and the boutique Grampians Estate, whose espresso signs and medal-winning reds attract 7,000 visitors a year. We don’t have time for the veteran wineries with their tempting underground cellars on this visit, but we do get to stop at Grampians Estate’s inviting cellar door – it’s kid-friendly, with a shady veranda for taking in a cheese platter and a drop of the local, and offers a bit of a wine education as well with a short tutorial ($20 a head). A relative newcomer on the block although its vines date back to 1870, 20-year-old Grampians Estate specialises in shiraz, ranging from the top-of-the-line The Streeton Reserve to the not-too-sweet Rutherford Sparkling that has garnered about half the estate’s awards 30-odd trophies. Find also pinot noir, chardonnay and riesling, amongst others, and a tasty Rutherglen topaque. 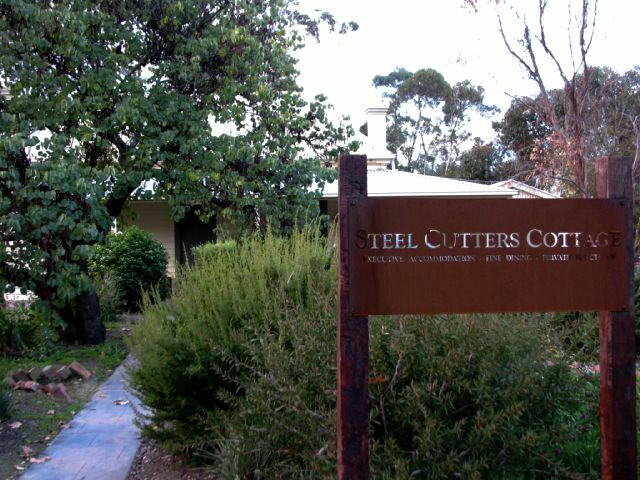 Great Western itself is otherwise a whistle stop, slated to be bypassed, but there’s a new B&B that hopes to change that – certainly, the Steel Cutters Cottage will be ideally positioned once the truck traffic is moved away from the front door. This century-old two-bedroom cottage, once the home of the town’s blacksmith, has been renovated in a mix of old and new. Owners Rohan and Marlene Erard aim to provide a gourmet B&B experience, and have installed a catering-quality two-oven modern kitchen to do their produce justice – they plan to expand the operation in future, using the kitchen to cater on-site for dinners. Rohan had a meal of lamb shanks in the oven when we arrived, the table set, the fire lit; all we had to do was finish off the polenta he’d prepared and dish up the meat and beans, washed down with a local drop, naturally. The provided DIY brekkie consisted of bacon, eggs, tomato, mushrooms, fresh bread, cereal: noms. The approach towards Halls Gap, the hub of the Grampians, offers several scenic routes from Great Western, but there’s no rush: not with Toscana Olives and Deirde’s restaurant next door at Laharum Grove. 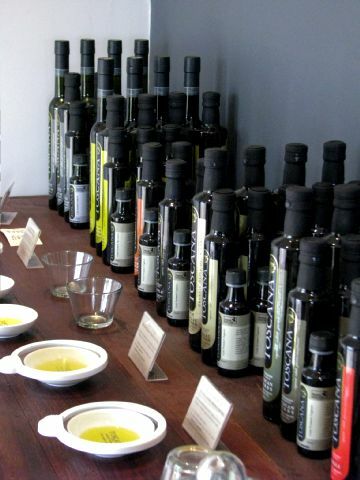 Toscana is a family operation, producing extra virgin olive oil sold pure and with infusions such as garlic, herbs and lemon. Also available at the farm store are hand-picked table olives, honey from the farm’s hives, shiraz and balsamic vinegars, and complementary local products such as hand-made soaps and sauces. Our host, Greg Mathews, tells us we’ve missed the production by a couple of days as they wait for a technician from Italy to install a new centrifuge – all processing is mechanical, ensuring the farm retains its organic status. But the emus have started the picking early, not that the family begrudges the visitors their share. ‘This’ is her eponymous restaurant, barely six months old, built in a former storage shed, the metal walls and concrete floor offering a rustic-industrial backdrop to very fine seasonal fare: a duck breast and beetroot salad for Kirstyn, and lamb with winter vegetables, couscous and tzatziki for me, a shared, divine dessert of semifreddo and rhubarb with vanilla cotton candy, washed down with Langi Ghiran shiraz and a coffee for the road. We go over the range to get to Halls Gap, passing through devastated areas – ash-covered ground, stark black trunks, road signs bubbled and blackened by heat – that speak to the ferocity of the bushfires, but as we wind through the national park the forest is largely untouched – while Halls Gap was evacuated, the town was unscathed, although tourism was hit hard, and some trails and sites remain closed. 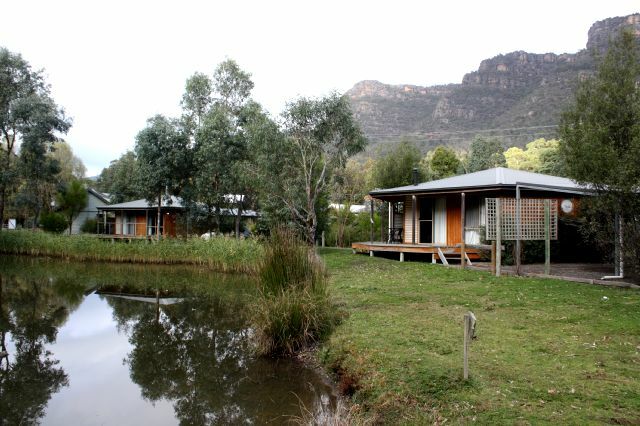 At the well-appointed Grampians Chalets, a short walk from the heart of the township, new owners Kay and Peter Rankin are enjoying the change of pace from their previous life in Sydney hospitality. The site has eight self-catering chalets: five two-bedders andee deluxe for couples. Prviously e’d had of the family cabins and found it quiet and comfortable, but this time we are in a deluxe: one large timber room with a spa and gas heater. The porch overlooks a pond populated with ducks and a heron, and in the paddocks yonder, a large mob of kangaroos graze. The roos come into the town’s yards at night, a perfect reason not to go driving after dark. How fortunate it’s just a toddle down for dinner – if only the footpath was better lit. Luckily, there’s not a lot of traffic, and we go roadside, delighting in the sight of a kangaroo and joey nibbling on an unfenced garden. At the Kookaburra Hotel, owners Rick and Vonne Heinrich are staging yet another makeover – they’ve been at the bar and bistro for nigh on 35 years, and have made it renowned for its quality food. 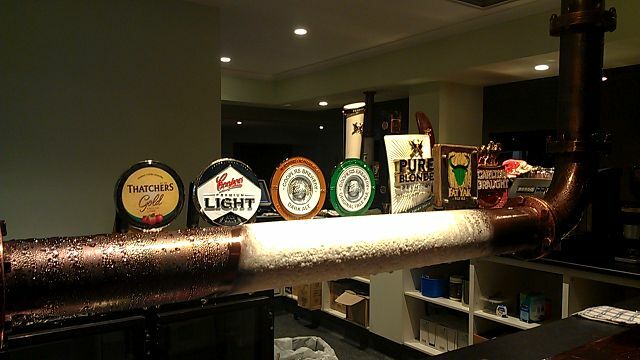 The renovation – the business was formerly the Kookaburra Bar and Bistro – is a week from being finished when we visit. The couple are introducing a lounge area for a more casual dining experience, but there’ll be no compromise with the menu: we enjoy a three-course meal of duckling risotto, a lamb rack with steamed veg and potato bake with an amazing herb and honey sauce, and mango, lime and coconut sorbet, all washed down with local pinot and a coffee for the stroll home. Rick’s not just a dab hand in the kitchen – he’s made the table tops and bar from reused hard wood, and they look spectacular. 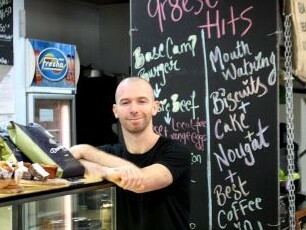 Down the street, Jason Ralph has returned to his home country after working most recently in hospitality in Melbourne, to open the Basecamp Eatery. 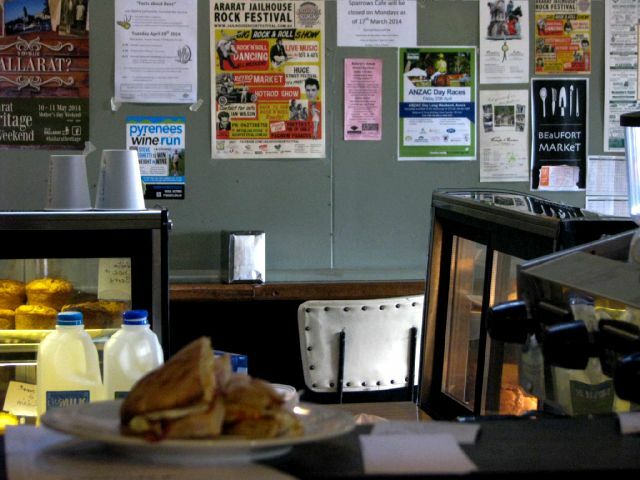 It’s a funky space, delightfully visually busy with chalkboards and coffee bags, and has a range of quality café tucker on the menu: pizzas, burgers, fish and chips, handmade gourmet pies, kebabs, and a breakfast including toast with jam, pancakes, and the brekky burger — it’s filling, with beef pattie, egg, bacon, hash brown and more. Mine is accompanied by a freshly squeezed juice and excellent coffee. Jason has plans to expand the business and slowly turn the focus to, as the name suggests, outdoor health and exercise, and there’s an area out the back just waiting to introduce a range of fitness activities to go with the splendid food and natural environment of the park. On the way home, we stop over in Beaufort, a charming highway town on the eastern edge of the Grampians tourism regions and also in line to be bypassed as the two-lane extension creeps ever westward. At Sparrows, on the main road, self-trained cook Cameron dishes up a range of tasty treats, from homemade sausage rolls to a delightful duck dish, meatballs with tomato sauce and a yummy hint of thyme, and cauliflower and ricotta fritters. Good coffee and chai, too. The day we’re there, a bevy of young waitstaff are kept busy throughout the café’s three rooms – Sparrows started as a veritable hole in the wall about three-and-a-half years ago but has expanded to take in all the space of a former car garage, and the décor is a wonderful mix of old signs, mismatched chairs and pastel-coloured timber doors. We don’t need dinner when we get home, and I’m kind of missing those wood and gas fires. Luckily, now we’ve moved to Ballarat, the Grampians is even closer! Another, shorter version of this article appeared in the Herald Sun on 28 June 2014. This entry was posted in travel and tagged accommodation, b&b, basecamp eatery, deidres, food, grampians, grampians chalets, grampians estate, great western, halls gap, kangaroos, kookaburra hotel, laharum grove, mt langi ghiran, seppelt, shiraz, sparrows, steel cutters cottage, toscana olives, tourism, wartook valley, wine. Bookmark the permalink.